The fabric is made using specially engineered yarn that is coated with carbon nanotubes. Researchers create new temperature-adapting fabric. It can change its properties to help regulate the passage of heat through it. As seasons and weather changes, so do the clothes used to protect ourselves from the environment. 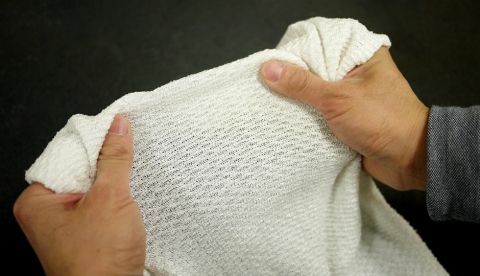 While there are fabrics that help with perspiration in the summer and provide insulation in winters but now, Researchers at the University of Maryland have created a new fabric that can change its insulation property dynamically to help regulate body temperature. The fabric automatically controls the amount of heat passing through it and this was made possible because the researchers used specially engineered yarn coated with carbon nanotubes, which is a conductive metal. The fabric allows infrared radiation or heat to pass through when the environment around it is warm and moist, similar to when one is sweating. Similarly, it reduces the escaping heat under arid and cool conditions. As per an article published by the university, the base yarn for the new textile is composed of fibers. These fibers are made using two different synthetic materials, one being hydrophilic (water-loving) and the other one is hydrophobic (water-repelling). “Because materials in the fibers both resist and absorb water, the fibers warp when exposed to humidity such as that surrounding a sweating body. That distortion brings the strands of yarn closer together, which does two things. First, it opens the pores in the fabric. This has a small cooling effect because it allows heat to escape. Second, and most importantly, it modifies the electromagnetic coupling between the carbon nanotubes in the coating,” the article explains. “The human body is a perfect radiator. It gives off heat quickly,” said Min Ouyang, a professor of physics at UMD and the paper’s other corresponding author. “For all of history, the only way to regulate the radiator has been to take clothes off or put clothes on. But this fabric is a true bidirectional regulator.” The new development was reported in the February 8 issue of the Journal Science and the new fabric is said to be the first of its kind. Depending on the tuning, the fabric either enables radiation of heat or traps it, and this is said to be a quick process so that one won’t realise when this is happening.